I have practised yoga on and off for a number of years. I attended a class once a week which my friend Angela, a qualified yoga teacher, taught. After being diagnosed with secondary breast cancer I stopped practising for a while. I have read quite a few studies on the benefits of yoga with breast cancer so wanted to continue again. Unfortunately Angela moved to Valencia but Jimmy, a yoga teacher and friend from twitter, had sent me a DVD which helped me practise whilst on chemo. I recently restarted classes with another local yoga teacher and found I was able to still do some advanced practises. Yoga is great to get the body more supple but gentle enough for recovering cancer patients and really does give a good work out. It clears the mind and helps you relax. Jimmy has wrote a piece about yoga for my website. Here is an introduction to him and what he does. Dr. Jimmy Kwok is currently working as the UK Head of Oncology Services at HCA (Hospital Corporation America) and enjoys teaching ashtanga yoga in his spare time. 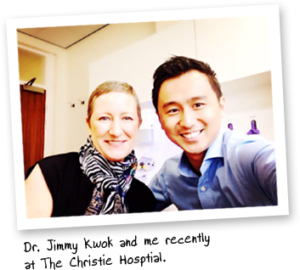 Jimmy gained his MA in Natural Sciences from Emmanuel College, University of Cambridge and his doctorate degree in Clinical Oncology (Breast Cancer) at Imperial College, London. Jimmy has also interned at Harvard Medical School, Boston USA and the oncology Department at Great Ormond Street Hospital, London. He is a keen advocate of the use of yoga for cancer patients and works closely with Maggie’s Cancer Centers to promote its use in recovering cancer patients. A review of the benefits that Yoga might bring to cancerpatients and survivors were conducted by CRUK in March 2010, where the scientific rigour of 10 clinical trials performed to date was examined in greater detail. A majority of the clinical trials participants were breast cancer patients. Reported clinical benefits included reduced levels of anxiety, depression, fatigue and stress, improving quality of sleep, mood and spiritual wellbeing. The assessment was that on balance, Yoga may improve the psychological well-being cancer recovery for cancer patients based on these studies but weak study designs, low number of participants in some studies prevented a firmer conclusion from being drawn. Within the field of breast cancer research, a substantial amount of research funding is provided for the development of anticancer drugs. In comparison, funding for research into ‘alternative methodologies that can improve the psychologicalwellbeing of cancer patients and their recovery is not as commonplace. Encouragingly, results from a very recent study conducted byProfessor Lorenzo Cohen, Director of the Integrative Medicine Programme at The University of Texas, MD Anderson Cancer Centre suggested that Yoga can benefitcancer patients undergoing radiotherapy. The study recruited 163 women with stage 0 – 3 breast cancer lasting over a 6 month period. They underwent 6 of weeks of radiotherapy and were randomly assigned into 3 groups which received different add-on instructions apart from their standard courseof radiotherapy. Group 1 received 3 hourly Yoga sessions per week; Group 2 received 3 hourly simple stretching exercise regimes per week; Group 3 acted as a control group who received neither Yoga nor stretching regimes. The most significant finding here is that women who practised Yoga registered the sharpest fall in a stress hormone – Cortisol (hydrocortisone). Cortisol is normally produced by the adrenal gland in response to stress. This is of particular importance because ‘blunted circadian cortisol rhythm‘ – a high level of blood cortisol levels in the body have been linked to worseoutcomes in breast cancer. Unsurprisingly women who practised Yoga also reported qualitatively that they have better general health, physical functioning and psychological wellbeing. Professor Cohen cited that “Teaching patients a mind-body technique like Yoga as a coping skill can make the transition less difficult.” What is more important is that the National Cancer Institute in USA has awarded the largest grant to date to the study of Yoga in Cancer to Professor Cohen’s team to conduct a proper Phase III clinical trial for breast cancer patients to determine the scientific mechanism of how Yoga can effect a better biological outcomes postradiotherapy treatments. They are also going to assess the costefficiencies of implementing Yoga programmes in hospitals. To date, this is the known clinical trial going to be performed to address how Yoga can benefit breast cancer patients. A recent paper published by School of Nursing, University of Pittsburgh states that Exercise in a variety of intensities and forms, including yoga for people recovering from advanced stages of cancer exercise can decrease anxiety, stress, and depression while improving levels of pain, fatigue, shortness of breath, constipation, and insomnia. They strongly suggest that people diagnosed with cancer should discuss with their oncologist safe and easy ways they can incorporate exercises like yoga into their daily lives. There are also numerous studies which have demonstrated yoga might benefit cancer survivors and patients suffering from all types of cancer including lung cancer, prostate, skin and ovarian cancer where the side effects of chemotherapy and radiotherapies are similar. A useful resource website Dr Yoga contains a wealth of resources covering the latest clinical research on how yoga could benefit cancer survivor and patients. You can also purchase the yoga for cancer dvds online, or at https://www.dryoga.co.uk/YOGA-BOOKS-FOR-RECOVERY.php where 10% of all sales are donated to Maggie’s cancer centres to continue to support its work in providing care and support for those affected by cancer. Out now Dr Yoga’s Yoga for breast cancer survivors and patients.